Step 2.1: Create a Stack - Chef 11 showed you how to create a stack that served a PHP application. However, that was a very simple application that did little more than display some static text. Production applications commonly use a back-end data store, yielding a stack configuration something like the illustration that follows. This section shows how to extend MyStack to include a back-end MySQL database server. You need to do more than just add a MySQL server to the stack, though. You also have to configure the app to communicate properly with the database server. 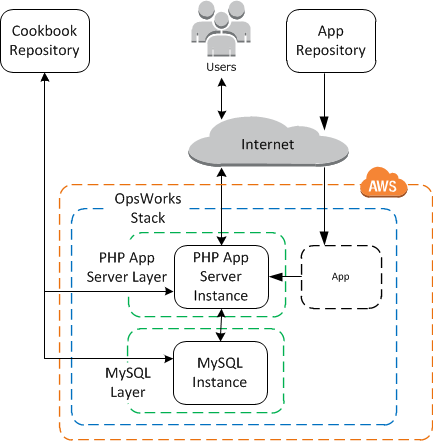 AWS OpsWorks Stacks doesn't do this for you; you will need to implement some custom recipes to handle that task.